If you are interested in upcoming content ICOs that already have a product on the market that has been tested by a large number of people, you are at the right place. This ICO review will show you all the most important information about the upcoming Contents Protocol ICO, and besides that, we will give you our opinion on the viability of investing in Contents Protocol and our estimate about the ability of this ICO to achieve its goals. We have to warn you that the Contents Protocol ICO has not published a whitepaper jet so, besides our Contents Platform review where we offer you most important information, you can search for more info at Contents official website or/and in Contents One Pager. As ICO don’t have whitepaper at this moment we placed our effort in this review to bring you most relevant and fresh information in order to save your precious time and to give you our opinion about this project. We promise that we will be brief and concise. 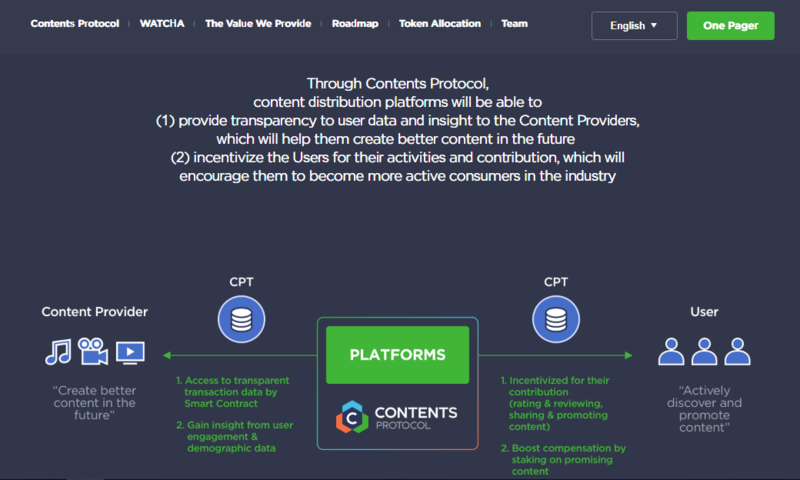 Contents protocol ICO is a decentralized content exchange protocol powered by Watcha Inc., the company that is one of the most popular movies, TV show and book review applications in Korea (launched in 2012 with founders Jihyun Won and Taehoon Park). The biggest advantage of Watcha Inc. applications is that once the app users give a movie rating that they have looked previously, the app offers them other movies they would like, in accordance with their personal preferences. In other words, Watcha Inc. offers personalized recommendation technology for movies (because it is based on Seoul running) so it is a review and recommendation service. The purpose of Contents Protocol Network it to decentralize the distribution channel that connects content providers and consumers, or in other words, this ICO allows distribution margin, which used to belong to centralized platforms, to be shared fairly and transparently among the network contributors such as creators and consumers, according to their contribution. In the following lines read everything about problem breakdown, sale process and other key elements of the Contents Platform review. But first we’ll do something that we usually never do in our ICO reviews: we decided to show you user ratings and downloads of Watcha Inc. (founder of Contents Protocol) in front of other review sections, because before reading other review sections you need to know the purpose and the meaning of the problem breakdown and solution. Of course, that refers to the application of the Contents Protocol for Watcha Inc. apps. Over the past six years, this company has impressed by over 4 million users and has about 380 million reviews by providing following services in South Korea and Japan: WATCHA, WATCHA PLAY, WATCHA MUSIC, and WATCHA WEBTOON. WATCHA is an application that is specific because it offers a personalized content recommendation based on user’s rating for movie, TV series, animation, variety show, and documentaries. WATCHA MUSIC is an unlimited music streaming service, WEBTON is comics recommendation, review and viewing service and WATCHA PLAY is payable service for movie and documentaries viewing, documentaries and so on, but the last three applications are not programmed for a personalized content recommendation (like WATCHA MUSIC). As we previously said, these apps are among the most popular applications in North Korea and Japan, and the exact reason for that is that they offer personalized content recommendations and the ability for each user to rate the content that has been reviewed. For example, between 2013 and 2017, the WATCHA PLAY app was proclaimed to be the best app of the year on the Apple App Store and Google Play and was ranked No. 19 for combined total revenue in both app stores. WATCHA has more than 380,000,000 ratings and reviews, 2,500,000 downloads and is rated 4,7/5 on AppStore, while WATCHA PLAY has 2,000,000 downloads and 18+ hours of viewing per month per subscriber. 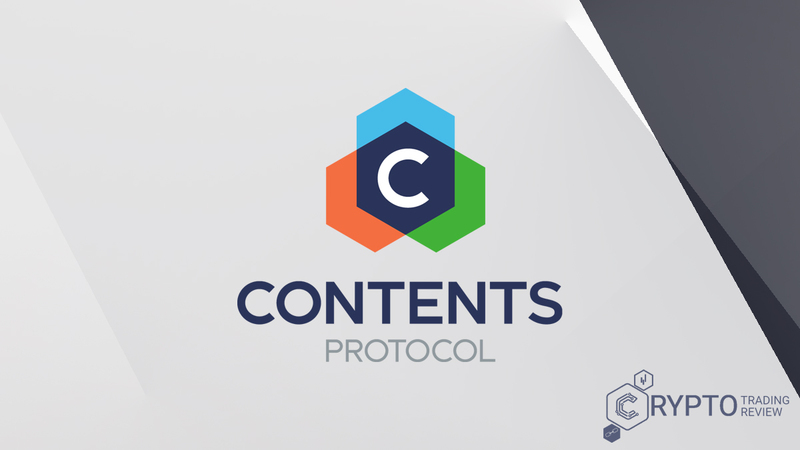 Contents Protocol ICO is one of ICOs that have a very strong and popular product on the market, so we expect a lot from this one in the near future. WATCHA PLAY already has a partnership with Samsung GalaxyS9 (for customers in Korea), but it is interesting that its content providers include Disney, BBC, Sony, Fox, HBO etc. Now that we have looked at the network of Watcha apps, let’s see which blockchain problems Watcha aim to solve and what solutions does it offer with Contents Protocol ICO. As we have said, the Contents Protocol ICO has no whitepaper so we’ll give you a quick overview of their One Pager. You’ve probably encountered these problems yourself and you know how annoying are they, and in the long run, they might be more irritating than the online paid content itself. WATCHA applications are decentralized, and the problems described above are planned to be solved by the implementation of Contents Protocol ecosystem solutions. Now there’s an interesting part of a review. Contents Protocol ICO will provide a distribution margin that was otherwise covered by centralized platforms and will share distribution margin through network contributors in accordance with their contribution to the ecosystem. However, you could expect this kind of solution while you were reading about problems caused by centralized online platforms, but still, let us show you this visually. Before reading the following lines of our overview of the Contents Platform ecosystem, allow us to make a brief pause and look at the implementation of the Contents Protocols solution. The situation with this ICO is very interesting and specific. The reason is that Watcha Inc. already has a very popular application on the market (used by many years now), user experience reviews and rates are used to improve product quality, and now Watcha Inc. wants to further enhance user experience and make a revolution by decentralizing a platform that is all about content exchange between providers and users of that content. Isn’t it a heaven when it comes to ICO (especially at a time when changes in GDPR occurred)? We have not a single doubt whether this project can be accomplished or not. If Contents Protocol wouldn’t have an existing application where Contents Protocol ICO solution would be implemented, then we would have some doubts whether Watcha Inc. could develop the application, whether this application would gain popularity, at which intensity would that app attract interested users and so on. But there is no need for these concerns because this ICO already has an application (not one but several) that are the most popular multimedia apps in the market over the last few years and have been recognized by the Apple App Store and Google Play, which is the reason why we decided to make research of this ICO. Now it would be wise to look at the roadmap to see when the implementation will be realized and how can we participate in this ICO, but we recommend you to read this review section by section for a better idea of Contents Protocol. Let’s now go back to the picture of Contents Protocol ecosystem. In order to remove the barriers and speed up the accepting process the Contents Protocol ecosystem, Watcha Inc. will launch an open source reference platform for each category/party that Watcha offers, as shown in the picture of Contents Platform ecosystem. WATCHA TV, MUSIC AND WATCHA WEBTOON (NOVEL) will be open-source reference platforms. 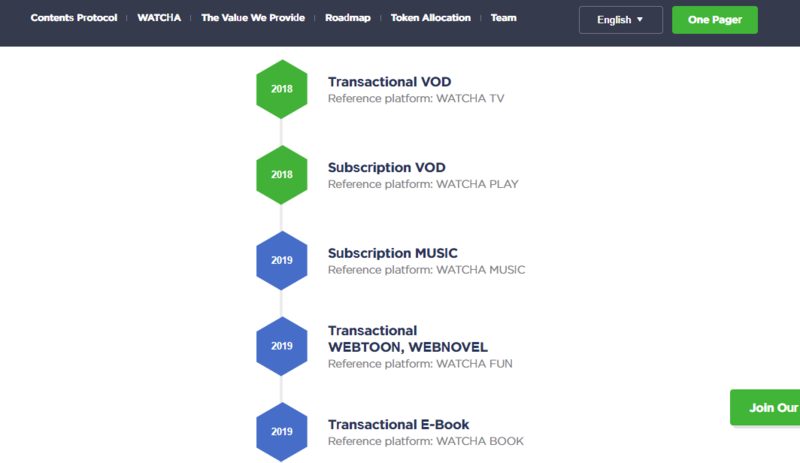 You need to know that Watcha still does not know whether it will develop its own reference platform or will engage an existing platform and turn it into a reference platform. On the one hand, we might assume that Watcha Inc. did this with frivolity because it still doesn’t know how the ecosystem will be developed (i.e. whether it will develop a platform from scratch or platform will be created by transforming an existing platform). On the other hand, we might conclude that such an approach is still a plus because the ICO project has to go through some other phases in which Watcha Inc. will be able to find the most appropriate solution of hot to approach the construction of an ecosystem platform. But we cannot make any concrete conclusions before we make the Contents ICO roadmap overview. Let’s now take a look of how decentralized Contents Protocol platform is designed, and after that will give you information about the whitelist (sale process) and roadmap, so stay tuned. The reason more to do so is that we gave you a special review of the Contents roadmap that will be particularly interesting. The Contents Protocol platform will consist of two key elements, which are content providers and app users. The most important solution that this ICO offers is visible in the previous picture. Compensations for users will be based on contribution to the network (blockchain technology) and content providers will have a transparent transaction of a high percentage of license fee & payment through a smart contract. Users and content providers will have an influence on the inflation rate. 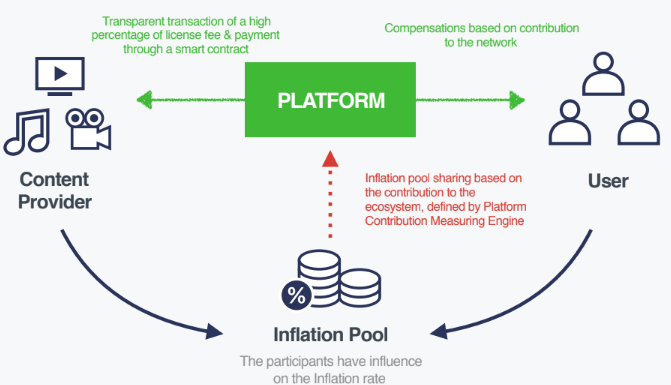 Inflation pool is based on the contribution to the ecosystem from both, users and providers, and is defined by platform contribution measuring engine. The great thing is that in this way the Contents Protocol ICO aims to decentralize the content platforms and offers transparent sharing and distribution on the basis of their participation on the network. Watcha application already has a transparent referral and content assessment system, and now all users and providers will have even greater benefit from participating in the app promotion. This is a great idea for ICO, and the implementation of the idea itself is not complicated. Both, content provider and users will have many benefits for using Contents decentralized content exchange protocol. Since the goal of this ICO review is to give you overview only of the most important information, we will not enter into all the benefits in detail, but if you are interested in the benefits for Contents Providers and Users at the Network, visit their web page or ICO One Pager for more information (for providers, general users, heavy / expert users and platform operators). Now when we know that the inflation rate is decided by the participants (share of inflation pool is based on the contribution to the ecosystem), that there will be high proportion of license fee and transparent transaction by smart contract, and that rewards will be based on the contribution, measured by C&DC Engine, we can go back to the Contents roadmap. Contents Protocol ICO has not jet set token sale starting date nor it has published information about pricing and bonuses (we know that the goal is $18,600,000 via ICO) so, unfortunately, we can’t give you this information right now, but we will tell you more about token sale and distribution in the token distribution section of this review. When talking about bonuses, we cannot say much about them (information is not yet available) but we can certainly say that there will be bonuses for content providers and Contents platform users (for making a stake on the Platform). Contents Protocol ICO roadmap starts in 2018 and ends in 2019 (unfortunately, there are no exact dates for each phase of the roadmap). 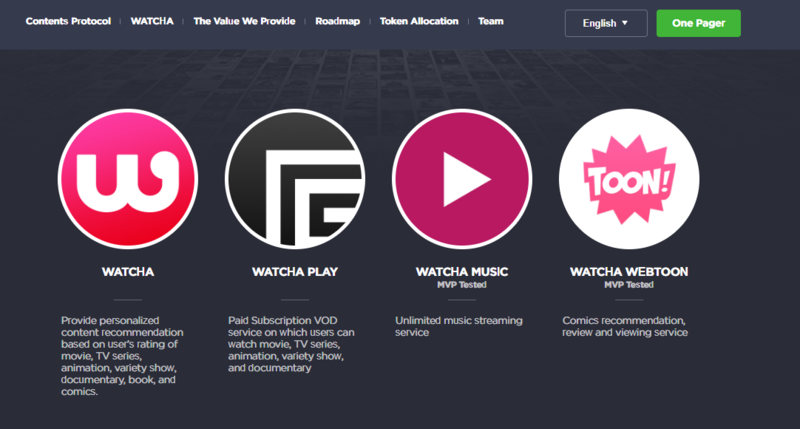 The Roadmap is divided into six phases, with each phase implying the introduction of the open source reference platform, and then the 3rd party platform operators (such as WATCHA TV, WATCHA MUSIC, and WATCHA WEBTOON, as shown on the Contents Protocol ecosystem picture). Plans for 2018 are transactional VOD (3rd party is WATCHA TV) and subscription VOD (3rd party is WATCHA PLAY). For 2019, plans are to introduce open source reference platform and 3rd party platform for subscription music (3rd party is WATCHA MUSIC), transactional WEBTOON / WEBNOVEL (3rd party is WATCHA FUN), and transactional E-book (3rd party is WATCHA BOOK). Once these stages of the Contents roadmap are completed, the integrated subscription will follow. Because the fact that we have very limited information from the Roadmap published by the Contents Protocol, we will have to look more closely at the team and advisors and their execution on past projects to make a better conclusion for this ICO. As far as the roadmap itself is concerned, it appears that Wathca Inc. wanted to be as precise as possible in how exactly open source reference and 3rd party platform operators will be introduced without predicting the exact time when this should happen. It is obvious that the goal was to first provide the most important information, so we hope that the ICO roadmap will be updated when the token sale begins. 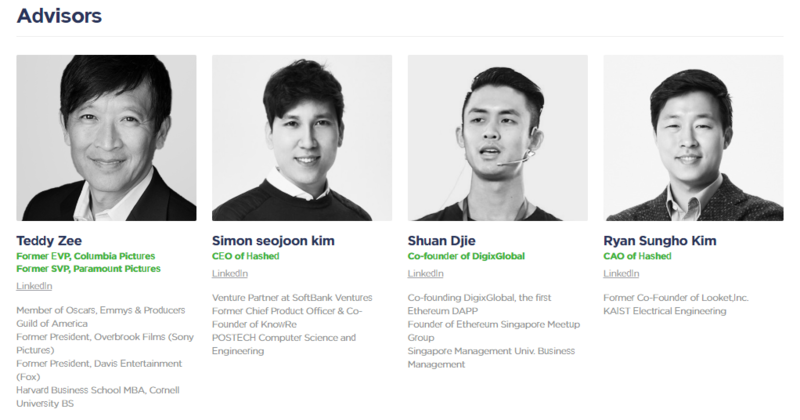 First, let us look at advisors: Teddy Zee, Simon Seojoon Kim, Shuan Djie, Ryan Sungho Kim, Lim Hong Zhuang, Jun Kim, and Junghee Cho. Two of them are CEO of Hashed, while one is the CEO of XSQ. Shuan Djie is a co-founder of DigixGlobal, Teddy Zee former EVP of Columbia Pictures and Paramount Pictures, and finally – Jun Kim as a serial entrepreneur and the partner of Kakao Ventures. When it comes to advisors, they are all business experienced and are highly educated u fields/industries in whom they operate, while some of them are highly successful in movies and other contents in which Watcha Inc. is focused. One example is Teddy Zee, the member of Oscars, Emmys and Producers Guild of America, former president of Overbrook Films (Sony Pictures) etc. We must definitely conclude that Contents Protocol ICO’s advisors are experts and that they are actually right people at the right place at this moment. Contents Protocol team consists of 34 people in total (advisors and investor team are not included). The team consists of members from different fields, and different experiences, all from marketing experts, HR and community manager, UX designers, web developers, infrastructure engineers, mobile developers and many others. As Contents Protocol team is numerous, we will not analyze everyone in person, but instead, we will focus at the conclusion about full team quality. We have already pointed out that we think it is pretty much easy to achieve the goals that Contents Protocol ICO has set in front project, and we have also said that the way in which these goals are presented is simple, which also goes hand in hand with our conclusion that a) this ICO will very easily achieve the token sale goal, and b) will not have a problem with the achievement of the goals. The ICO team is diverse, has all the necessary people who already (most likely) know their tasks in this project and they already work on them, have experience in their work field and are ready to make this project to the full. We can assume that some of them already have worked for Watcha Inc. for a long period of time (on all or some of Watcha applications), so this is probably the team that has already been working together for some time now and is now working on a new project within the same company. The most important investors are David Lee, Hashed, Signum Capital, Cocoa Ventures, XSQ, and Alchemy. DAlchemy deals with investment and consulting in blockchain and digital asset industry, Hashed is a blockchain project, focused accelerator and investor, and has so far invested in KyberNetwork, OmiseGO, EOS, WAX, Medibloc, etc. 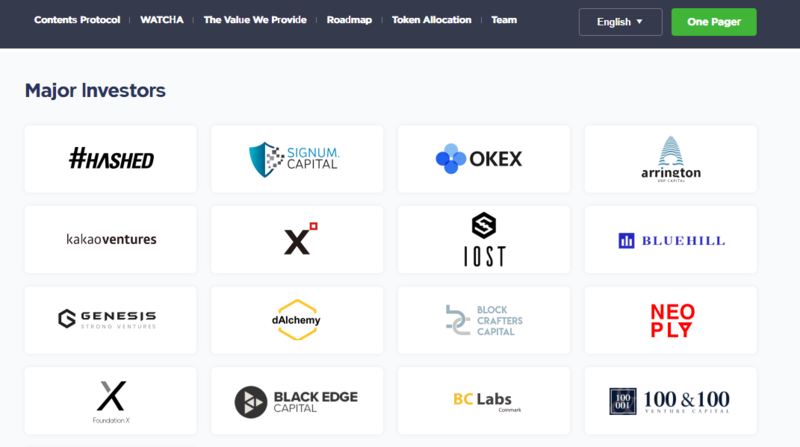 Signum Capital is a Singapore-based firm that exclusively consults in Blockchain-enabled companies. David Lee is managing partner at Refactor Capital, which (Refactor Capital, not David) has invested in Airbnb, Snap, Github, Pinterest, Dropbox, Stripe and other platforms and the world’s most popular communities. There is not much to say about investors, except that they are very careful about which project they will choose to make an investment. If you look at projects in which they have invested in the past, you will notice that they are only the largest and most popular applications, platforms and networks in the world. If you recall what we were talking about in the section about Watcha Inc. personalized content recommendation, at the beginning of the ICO review, at this moment you will understand why the Contents Protocol ICO, or to be more precise, Watcha Inc., is so desirable for investing. Contents Protocol has more than 5,000 members on Telegram. It seems that Contents Protocol ICO is mostly active on Telegram (Telegram URL is the first button at Contents Protocol web site). Unfortunately, we must say that it is the only one. The whole Contents Protocol official website offers a detailed overview of ICO information, primarily because Contents ICO doesn’t have whitepaper so the web page serves as more detailed One Pager. Nevertheless, take a look at Contents One Pager for more details about Watcha Inc. applications and other information about Contents Protocol ICO. When talking about team and the advisors, not everyone has a LinkedIn profile. Contents Protocol ICO has only 8 followers at LinkedIn, so we went to see how much followers Watcha Inc. has and saw that there are only 13 followers. None of them is present at Twitter, while Contents Protocol has 9 followers at Facebook. We must be sincere with you and announce you that we are surprised with such a low hype in the media because Watcha is very popular as we stated earlier in this review. On the other hand, for this ICO who doesn’t have nor whitepaper nor high activity at social networks (except Telegram), we shouldn’t take this negatively because these apps are highly popular and worthy at the Korean and Japanese market. As we said earlier, a token sale goal is $ 18,600,000 (40,000 ETH). Contents Protocol ICO token (CPT) type is ERC20. Apart from this information, we know that 30% is available for token sale. At this moment, we have to point out some interesting things about the use of token: content providers may choose to be paid real time in CPT Tokens through a fair and transparent smart contract, which encourages a rapid expansion of the Contents Protocol ecosystem. Now let us show you the token allocation (next image) and then the token distribution as well. As you can see, there are 30% of tokens available for token sale, which means that the biggest percentage goes for token sale. Then there is 15% for biz-dev contents and platform investments (total 30% for biz-dev and investments) and an additional 15% for the company and team. For company building, there are 5% of tokens, for reserves 7%, 7% for copyright management and 4% for advisors. The important and interesting thing is that most tokens are available for the token sale. We must highlight that the goal of $18,000,000 is not that hard to get when it comes to ICO, and second, the amount of $18,000,000 is justified according to the roadmap and other available information. Contents Protocol ICO should not have problems with reaching this goal, and the set way of token allocation and distribution is simple and easy to achieve. 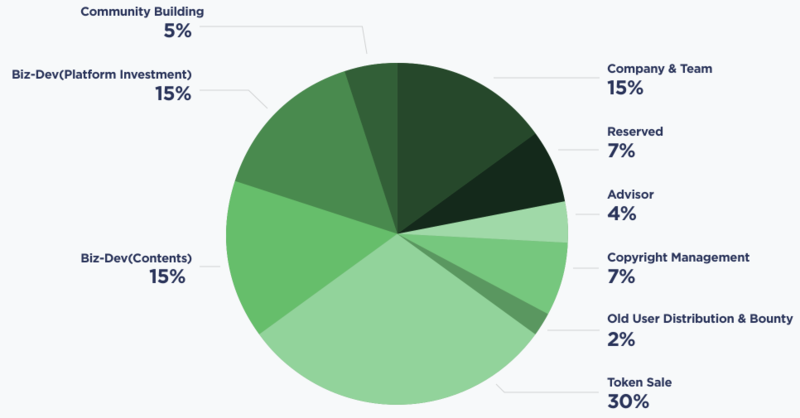 Now let’s take a look at Contents Protocol ICO token distribution. Inflation pool implies the existence of the platform contribution measuring engine and smart contract. Smart contracts and contribution measuring engine (e.g. WATCHA TV, WATCHA MUSIC etc.) are included in each platform. Finally, we came to the most important part of ICO review so make sure that you carefully read about the use of Contents Protocol tokens. User payment (and content provider’s payment) is an important aspect to note when it comes to token distribution. This implies the use of contributing and distributing engine and again, smart contracts. When it comes to the smart contract, each platform decides its C&DC indexes at its disposal. The content provider has license fee (70-85%) and the Platform itself 5-10%. The user for a stake (after conversion to CP power) has 5-10% and the other users who contributed 5-12%. When it comes to rewarding users, there are 10% which is automatically staked to the content and the user can boost compensations by increasing his stakes of CP power in a content, and there are 10% as well, for user compensation which is based on the contribution to the network. We must point out the idea of Contents Protocol ICO design might seem complicated, but is actually extremely simple. The app user will continue to use them as he did until now but will have many more features and benefits. These applications already have more than 18 hours per month for each individual application user (running 18 hours per month on the app), which could be increased after the implementation of these solutions. The use of token (or token distribution) can be explained as follows. Users and content providers stake increases according to their contribution to the Contents Platform. Take a look at the picture below. Picture relates to content providers benefits. 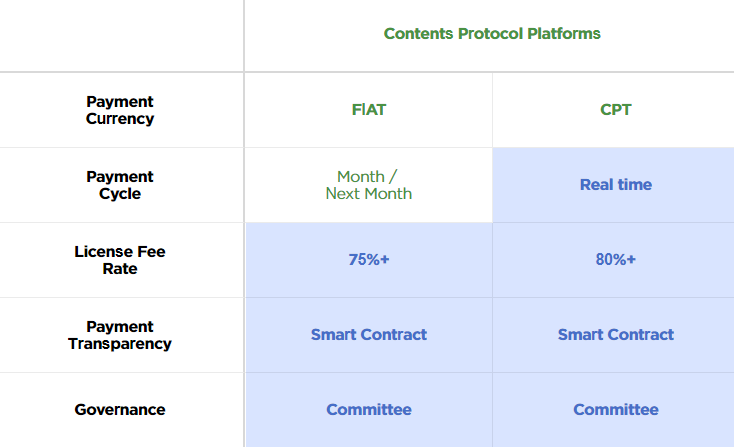 We’ve downloaded this table from the Contents Protocol official site in which the benefits of Contents Platform are compared to traditional platforms, but we removed the part about traditional platforms from this picture, so if you’re interested in seeing more about them, go visit their website. As you can see in the picture, Contents Protocol allows payment in the CPT (for content providers) and the payment transparency is ensured with the smart contract for both payment currency options. The only difference is that when using fiat content providers will have about 75% license fee, and when using CPT 80% or more. The other difference is that the payment cycle is in real time for CPT and monthly for fiat. Obviously, the use of CPT will be more appropriate to the content providers. It is interesting that there is a 30-70% licensing fee rate for traditional platforms, and the Contents Protocol ICO percentage is never lower than 75%. At Contents Protocol ICO, the platform’s operating cost is sourced from the inflation pool, while the distribution margin that used to belong to the platforms is fairly and transparently distributed to content providers and users. Is Contents Protocol ICO Safe? Yes! There is no doubt about the safety of Contents Protocol, and proof of this is the fact that they already have a developed product that surely benefits thousands of people, as well as the fact that they have been rewarded by Apple App Store and Google Play several times. There is not much to conclude about the Contents roadmap because it is not described in detail by the ICO, but if we take into concern information that we have at this moment, it is obvious that the Contents Protocol will easily achieve the goals it plans (according to roadmap). Although it is still unknown when the token sale will start, we can see that the token distribution and allocation is very cleverly planned. For this ICO we have no objections, we can only expect that development of these applications will continue in the future. The popularity of applications should increase if the ICO project phase succeeds, so the only doubt is if people would recognize this on time.